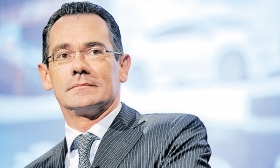 Lotus CEO Jean-Marc Gales has talked about producing an SUV. FRANKFURT — Lotus' new Chinese owner reckons Porsche's successful range expansion into crossovers and other models over the years could serve as a template for the struggling UK sports car maker, a senior executive said. Zhejiang Geely Holding Group, which also owns Volvo, signed a deal to buy a majority stake in Lotus from its Malaysian owner, DRB-Hicom, in June, securing the future of the company. Now it is plotting how to achieve what others have not and turn it into a money spinner. "It has a brand image that hasn't faded," Carl-Peter Forster, Geely board member and chairman of Geely-owned London taxi maker LEVC, said on the sidelines of the Frankfurt auto show. "It's small volume but we all believe there is more opportunity than the 1,500 to 2,000 vehicles that are currently sold." Forster, a former CEO of General Motors Europe, said Lotus could easily expand to produce "any size of car and any number of cars" without straying from its brand focus on compact, lightweight and agile cars, citing Porsche's rapid growth after launching the Cayenne crossover in 2002. "If you look at a pretty famous southern German sports car manufacturer, they were able to very successfully expand the brand without diluting it," he said. Lotus CEO Jean-Marc Gales has talked about producing an SUV in the past, but the project seems to have stalled in recent months. LEVC's new plug-in hybrid London taxi uses a lightweight aluminum platform constructed in much the same way Lotus builds its sports cars, and Forster said there would be cost synergies between the companies. He said: "The team will be happy to provide support if Lotus requires support."